As students head back to school, many will take their own smartphones for the first time. Others will enter classrooms where they will start regularly using the internet for school projects. 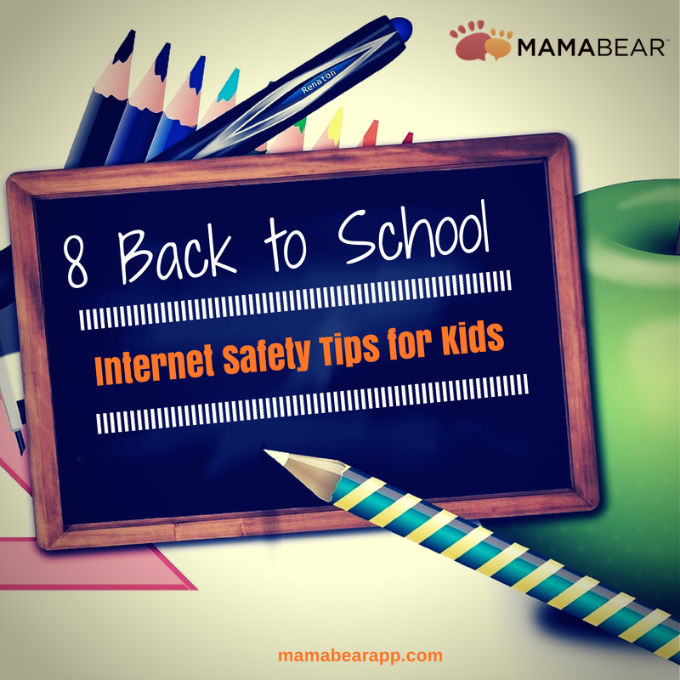 So this year, it’s time to add one more item to your back to school checklist — discussing internet safety tips for kids. Here are eight important online safety conversations to have with your child before the first bell rings. 1. Use the privacy settings to keep your account private. Each social media account has their own features for keeping your account private. Go through each account to make sure you are only sharing information with close friends and family and that all personal information is hidden. 2. Don’t give your password to anyone but your parents or primary caregiver. If a friend, teacher, or babysitter asks for your password, say no. If an adult insists, tell them you need a parent present before you can share access to your account. Friends don’t need your password, and no adult should request it without a parent’s consent. 3. Don’t share sensitive information about yourself or your family online. Sensitive information includes your: address, name of your school, phone number, and age. If someone repeatedly asks for such information, tell a parent or adult. 4. Don’t share photos or posts that would embarrass or expose you or anyone else. If you can’t tell what is embarrassing or racy, ask yourself, “Would it be okay if this was shown on television news or attached to a job resume?” If the answer is no, then don’t post it. Images and words create a lasting digital footprint that can be hard to delete, so always think before you post. 5. Don’t accept requests from anyone you don’t know in real life, even if you have multiple mutual friends. Only accept people that you personally know, and don’t accept someone just because many of your friends have. 6. Never agree to meet in-person with someone that you met online. People that you know online are strangers in real life, and they are just as dangerous as any other stranger. If someone asks you to meet them, remember the stranger danger rule — say no and immediately tell an adult. 7. If you see any type of cyberbullying, don’t respond or participate. Go tell a parent immediately. Even if you are trying to stop someone from bullying, it is better to not get involved. Instead, notify a parent or adult so they can address and help solve the problem. 8. Talk to an adult if you encounter anything that makes you uncomfortable. Cyberbullying may be easy to spot and identify, but there are other internet dangers that may not be as obvious. If you have any internet encounters that feels weird or unusual or awkward, tell an adult. It’s important to have open communication about social media and online safety with your child. In the real world, have regular conversations that discuss both the upsides and the downsides of the internet. Then connect through MamaBear Family Safety app to stay connected in the digital world. The free app is available for both Androids and iPhones.